again within 2 months’. Even many friends asked me same question; ‘Why you going the same place again’? Honest answer from my side is Mother nature, certainly the glory of the Monsoon. 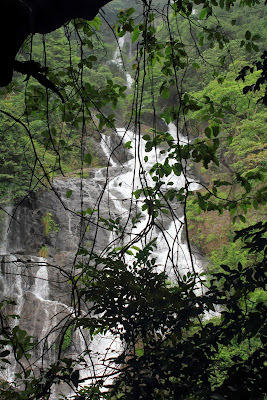 I am again back to Dudhsagar in this monsoon while going to one more hidden falls ‘Tambdi-Surla’ near Kulem (South Goa). Last time I was more disappointed due to huge crowd at Dudhsagar who littered the whole place. This trek is one of the most memorable and remembered long time. There are mainly 2 reasons made me to do this trek. 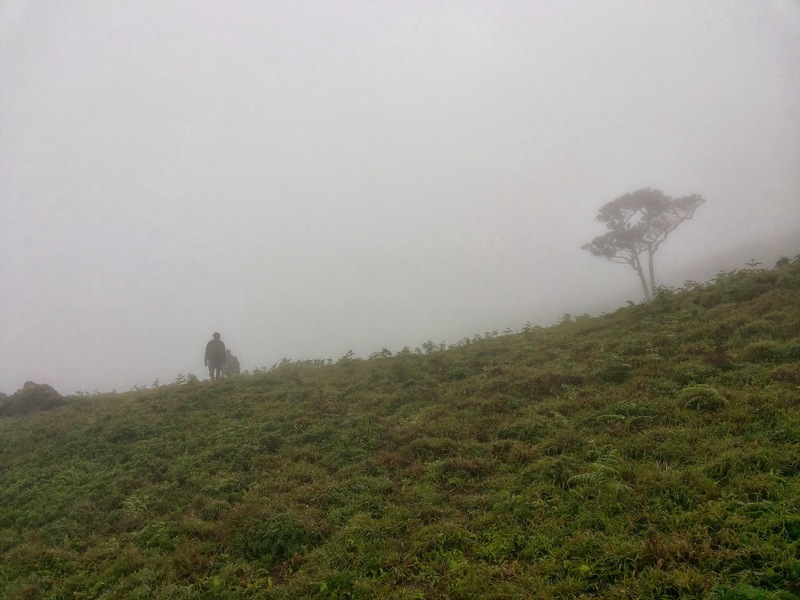 Firstly, this trek route was little varying from the previous one and my friend Sudhakar insisted me to be accompany to him. Always, Dudhsagar is more demanded event in BASC (Bangalore Ascenders). Thanks to Raveendra extending the team size from 12 to 24 and giving us opportunity to be part of this wonderful trek. Well in advance we had received detailed information mail from Raveendra. 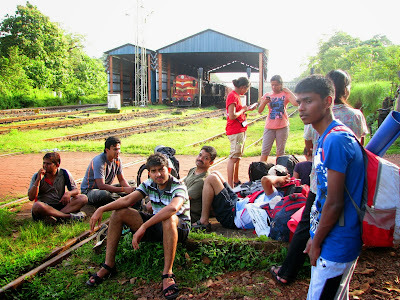 We 22 enthusiast trekking friends (2 drop out at last moment) boarded Bangalore – Solapur Express train. I, Sudhakar and Chandrakanth joined them at Yeshwanthpura. I am more happy that, after eight months we all three together in the trek. Few of them repeated faces and rest were new. I had opportunity to make new bunch of friends. Appreciate to BASC as always unknown trekkers become friends within short span of time, this journey was too. We have settled down with our trek gears to the respective seats. Now the time is to enjoy the journey. The whole group divided into two team and played UNO card game. Most of us were new to this game however it is very interesting and everyone enjoyed a lot. Our mentor of this game is Megha, thank you so much to introducing this game. The whole compartment is disturbed by our scream. The time is to say good night and we slept around 11.30 pm. We have to get down at Hubli and need to catch Vasco – Chennai express train to Dudhsagar. 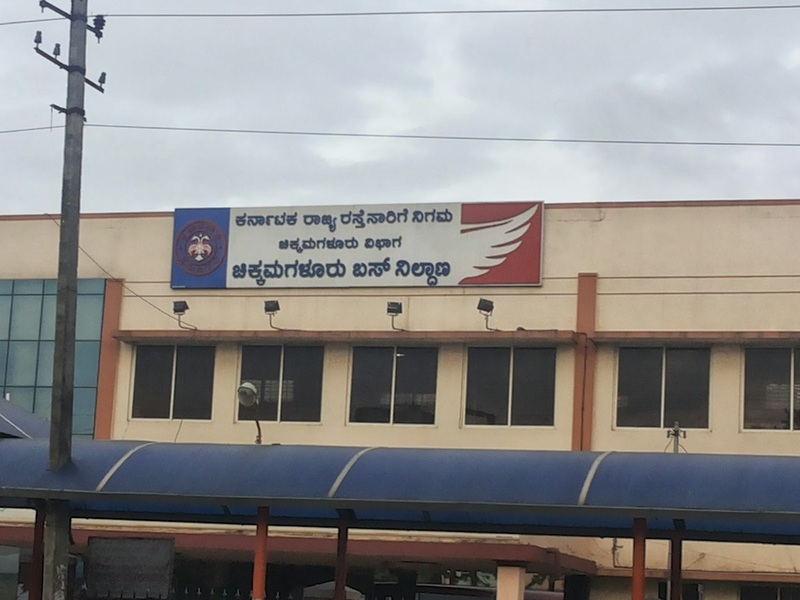 Reached the Hubli railway station as per right scheduled at 4 am, the next train is at 6.45 am. Enough of time to get freshened up and finish the breakfast. 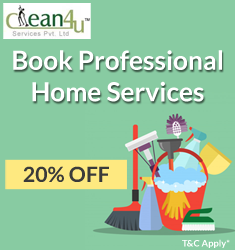 Took permission from Raveendra and headed me, Sudhakar and Chandrakant to our cousin house which was very close to Railway station. Finished morning duties and had yummy Upama breakfast at Railway station and rejoined to the group. The train was arrived right time we all got in the train and everyone got seats. From Hubli to Dudhsagar is around 3 - 4 hours journey. Continued the team with Antakshari, UNO and Dumb shade games. We were attraction to the whole compartment. Reached the Dudhsagar around 10.30 am. Comparatively the crowd was very very less to my previous visit. May be now the monsoon coming to an end or might be its Saturday noon. 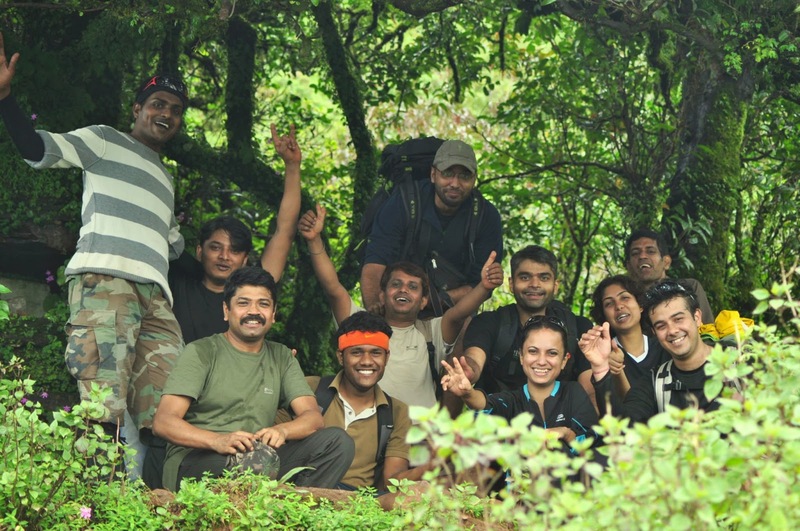 We all geared up in trekking mood. Mean time one of friend Ashok offered his shoes to Monkey and which he did not expect it take away from him. 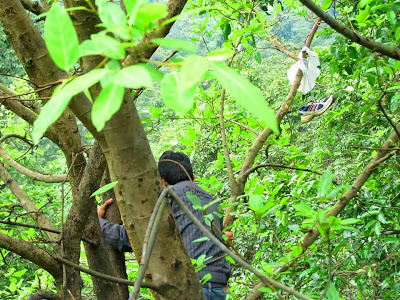 Tried and tried at last monkey understood nothing eatable item inside and left the shoe cover hanging to branch. With great difficulty Ashok could able to get it back and this incident is become so popular whole trek. After half a km walk on the track we had the first view of the glorious Dudhsaagar. In fact the falls was not roaring like my last visit in July but the beauty it remains. We spent around one hour at falls. Friends were busy in taking photographs with different poses. 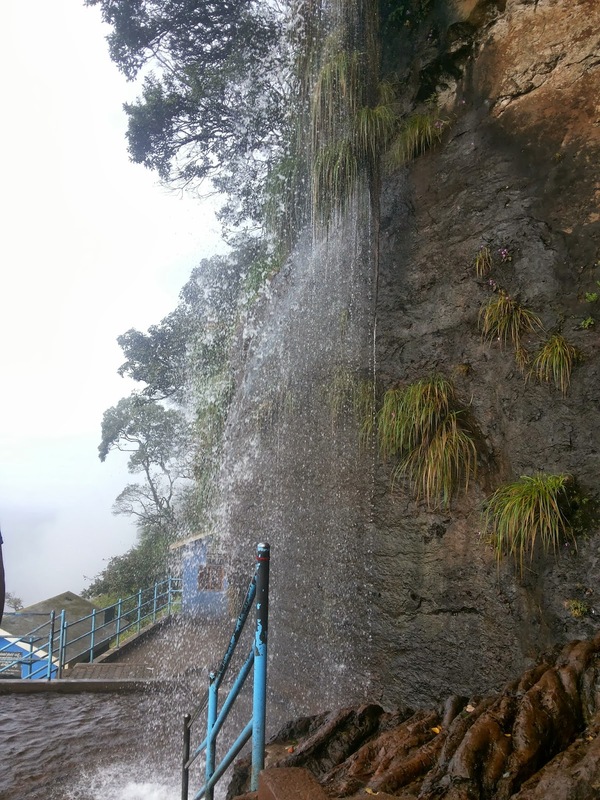 I felt its worthy again visiting the Dudhsagar as I could able to enjoy the falls without much crowd. After many group photographs we moved further on the track towards Kulem. Hope I am the one person who was repeatedly visited this place. Walking till Sonalium on the track need to take right diversion into jeep track. The sun was on our straight head; people wanted to take a break for lunch. I suggested Raveendra that we get a Temple after the Sonalium which is perfect for Lunch. Due to some misunderstanding the place the group split into two. One in which I was found a stream beside the temple and we were relaxed some time. After long time when the other group not reached decided to find out where they are. Understood from the villagers and few bikers they headed further and relaxed at stream. With great unhappy we decided to join the main group and take the lunch as the relaxed place was perfect for lunch. Everyone brought delicious homemade variety of foods. Shared among and good tasty lunch. Couple of minutes relax at stream and headed towards Kulem. Due to more humidity everyone wanted to jump into water. I was earlier to small falls which is just a km before the Kulem and ideal to have good time in water. The team was agreed and moved towards falls. 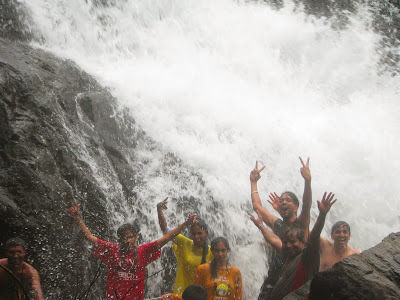 Everyone jumped into the water and had enjoyed lot. The time was around 4 pm; now the team is headed towards Kulem. Raveendra pre-booked the Tata Sumo’s (TS) to drop us to Tambdi-Surla. Reached the Kulem at 5 pm and relaxed near track. Dumped our luggage on top and headed towards Tambdi-Surla. 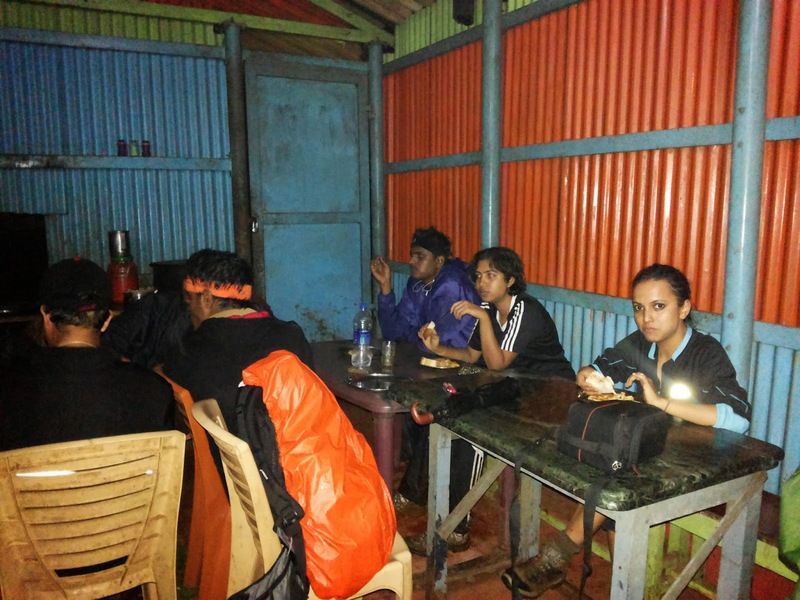 Ordered the dinner at Kulem hotel who delivers the parcel in the evening at our base camp. Distance of Tambdi-Surala is around 18 km from Kulem. Reached the base camp at 6 pm. The location was really so beautiful. Its around 4 km away from the village and so calm and beautiful place. Around you can see big hills covered with green everywhere; divine Mahadev Temple which maintained so well; whisper of stream and birds and last but not least a beautiful haunted house. We all were busy to choose the night camping site. 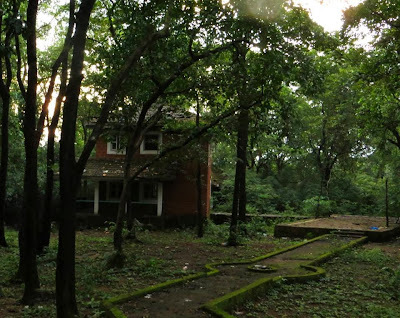 The haunted house is ultimate for night stay whereas the other trekkers group or drunker made completely dirty. Need lot of efforts to bring it to back and few of our friends (especially girls) did not wish to stay here. 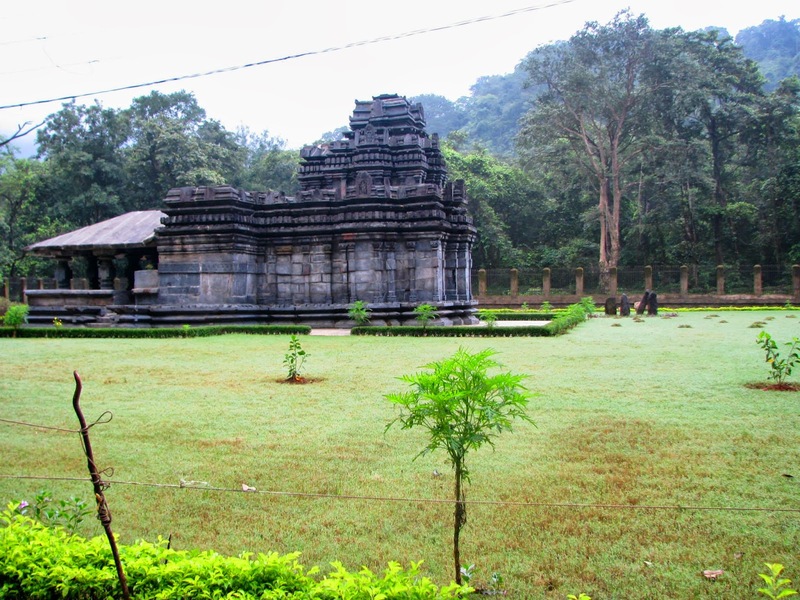 Our next choice was Temple; the temple is covered with well built by compound and locked the gates. Getting inside we need to jump the compound which Raveendra not at all ready because it is against the law. The sun was completely shut-down and dark covered everywhere. The last option was to sleep on the bridge. 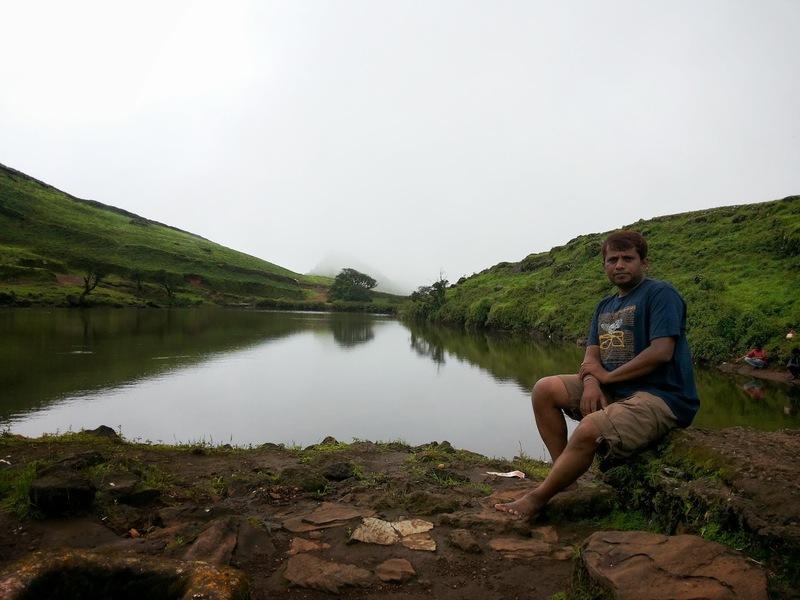 Appreciate and thanks to Raveendra choosing this place; never spent such a wonderful night whisper of stream. Dumped our luggage and everyone got refresh. Raveendra asked me to bring the soup at last moment as at least we can have hot soup in the night. Wanted to prepare the dinner for all; during monsoon getting the dry woods is very difficult and the team size 22 which required big vessels so dropped it. Our great friend Shanthi Prasad (SP) who always ahead and volunteer for food preparation busy to light the fire. 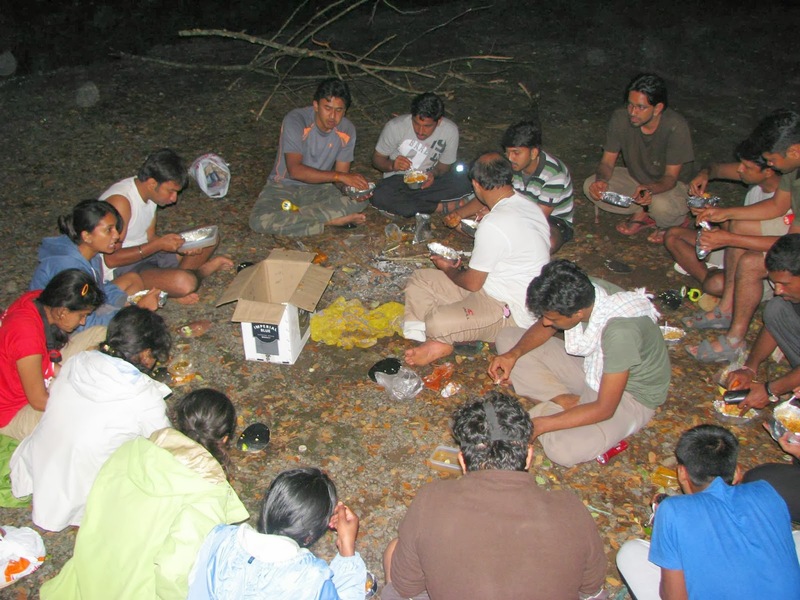 Everyone contributed to light up; with great difficulty SP could able to prepare the soup with co-volunteer Chandru (HR). Soup was ready and gave relief to tiered body. One more gang engaged to light up the fire for fire camp. Struggled a lot; they could able to get smoke rather a fire. Now the time of introduction to each member. We all settled in circle around the smoke (not fire). The introduction part was very interesting; given different assignment to all members based on their skills. Many hidden talents came out and helped us to understand more about the friends who were with us since 24 hours. Few are great singers; poets; musicians; cyclists; organizers the list goes on. This part took almost 2 hours and we all were feeling hungry. Everyone was waiting eagerly the dinner parcel. Reached the hotel guy with parcel of Palav & Jeera Rice. All finished the dinner and singing Antakashari continued till 10 pm. 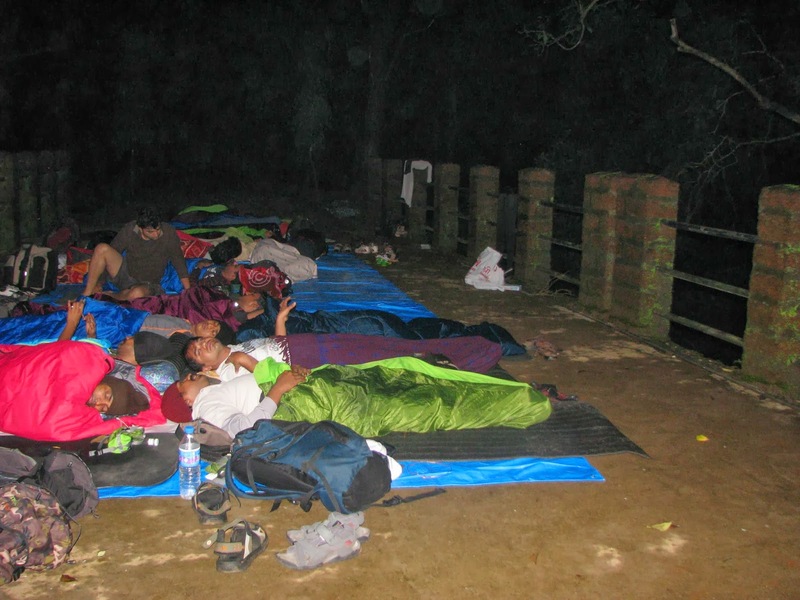 The night was most memorable; all taken out their sleeping bags-mats; sleeping under open sky and stream. Great experience !!!!!!!!!!!!!!!! As usual woke up so early at 5 am; followed by Vijayanand & SP. Finished our morning duties and next destination is to conquer the Tambdi-Surla Falls. Night I was not had yummy dinner; feeling so hungry. 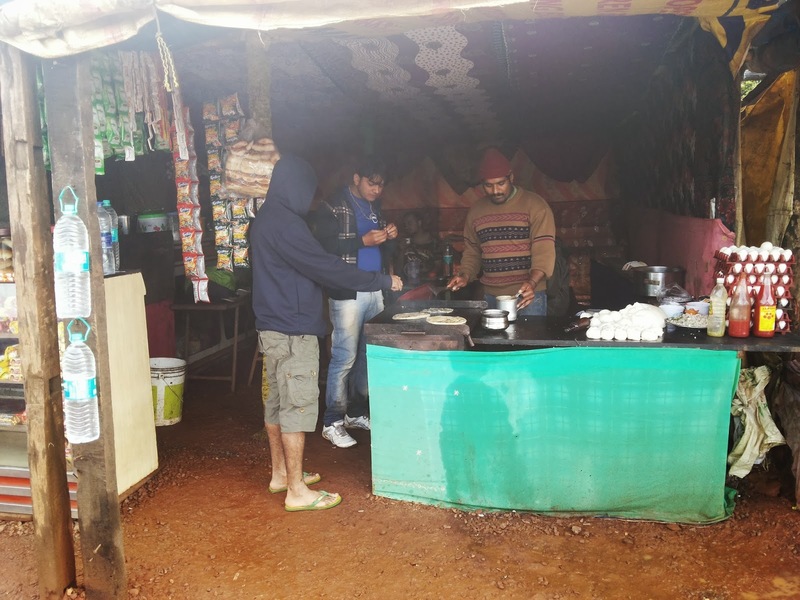 Bread jam and chapatti supported me and followed by biscuits. Vijayanand, SP, Sudhakar and other friends also joined with me. Everyone got ready and we left to the falls. 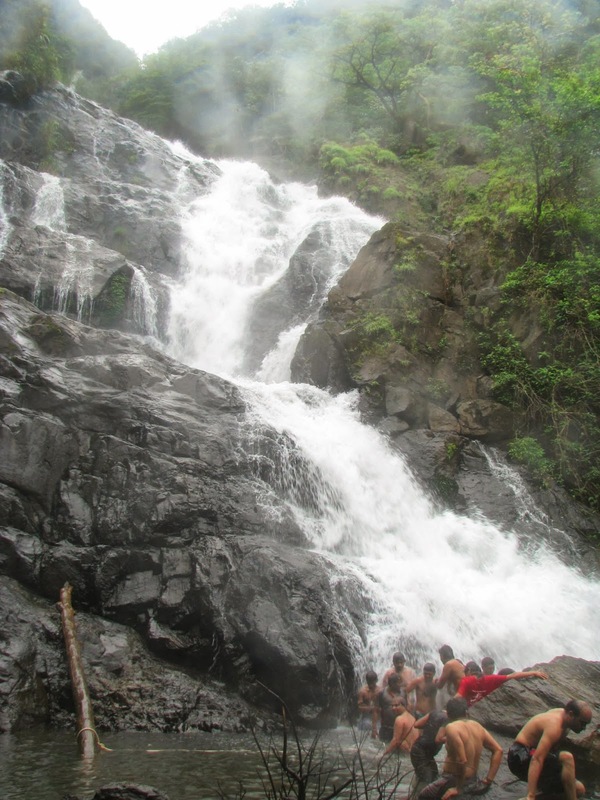 The falls is around 4-5 km away from the base camp. Need to take left deviation into the forest before the Mahadev Temple main gate. The path is well defined and the thrown plastic bottles, biscuit and chocolate wrappers lead you till falls. 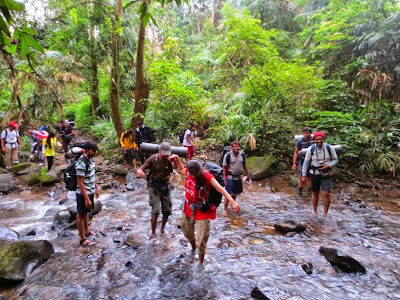 It is a dense forest and need to cross few streams. 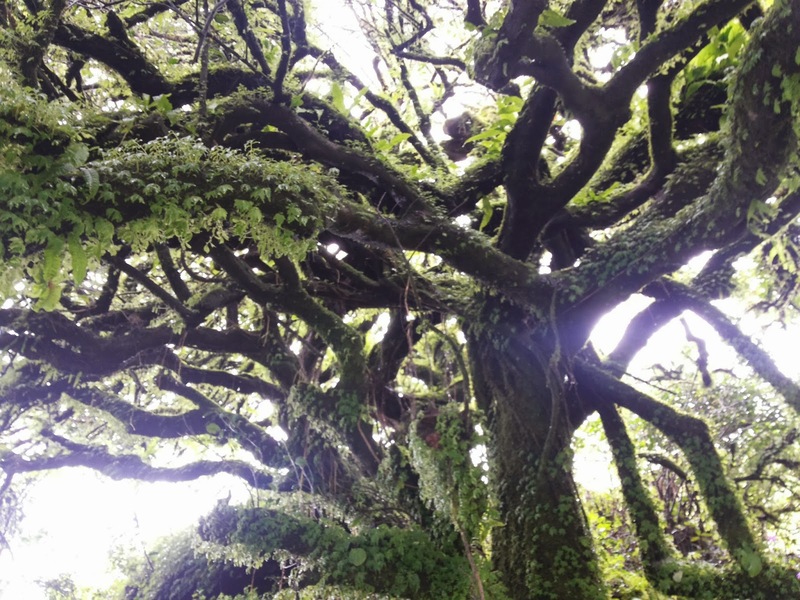 Walking into nature is thrilling and so much delighted by Mother Nature. There is no confusion in the path just we need to follow the trail. 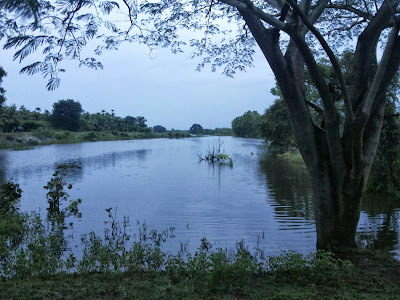 We get one big stream; hope in swing monsoon difficult to cross it. The only difficulty on the path is thrones. Most of the trees are thrones and very difficult to take support of them. The good pace of walk around one and half hour reached the falls. On the way we met a baby viper. Looking the first view of the falls everyone just said ‘Woooooooooooooooow’. The Tambdi-Surla falls roaring with glory and nobody not like stay away without dipping in it. All jumped into the water and enjoyed a lot. Visiting the place is very worthy; you enjoy the glory of the Dudhasagar in your eyes whereas Tambdi-Surla invite you to dip in it. Everyone had only one word ‘it’s worth to visit here’. Spent almost 2 hours at falls and now the journey back to base camp. Descending pace was fast and few of friends wanted to take a break and finish the breakfast. 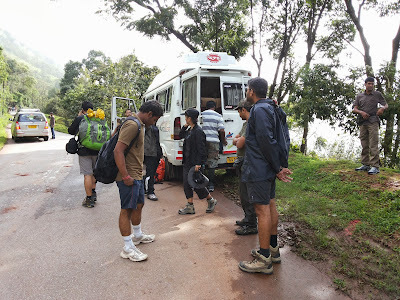 Now the drizzling started and few of us not wanted to take break and headed towards base camp. Now the rain started pouring heavily; can easily recognize the water level up in the streams. 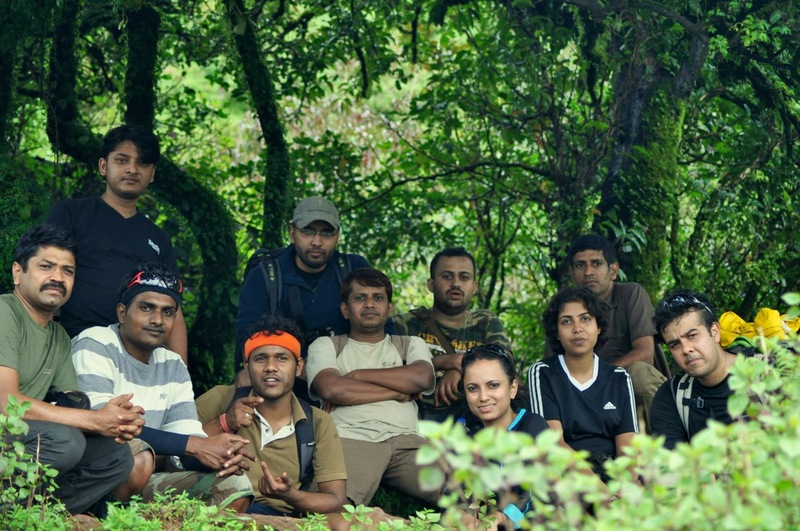 Reached the base camp around 11 am and had good time in the stream. Later one by one joined with us and took many beautiful photographs. The rain was pouring heavily. 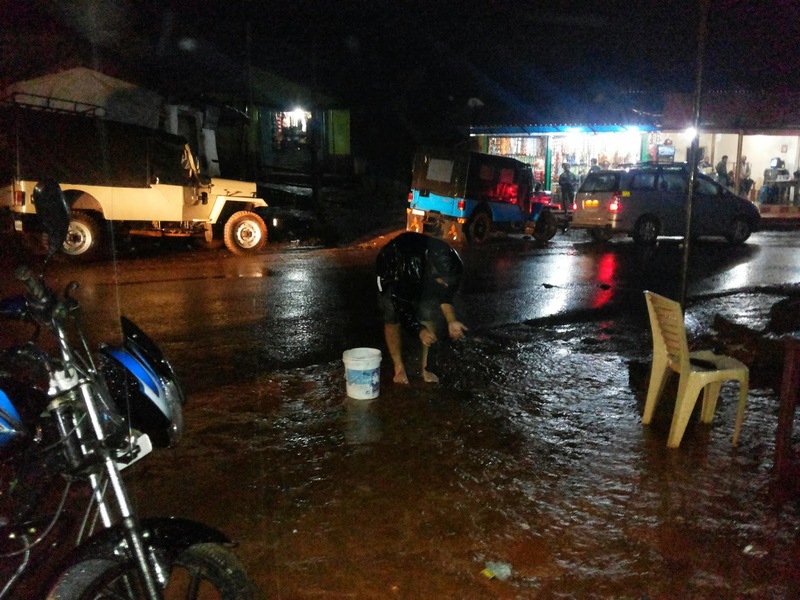 Raveendra warned us to come out as the water level may get increased suddenly. 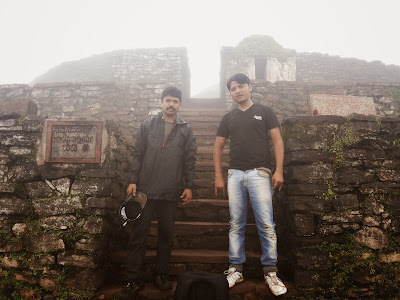 All walked towards Mahadev temple. The temple is maintained so neatly and devotees are more. 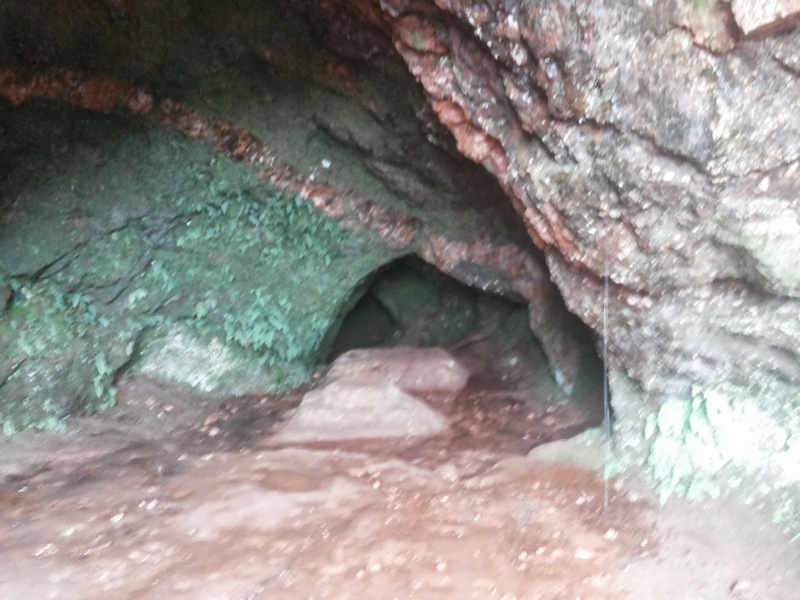 It is protected under National Monument by Archaeological department. We become child in the rain; remembered our childhood play ‘Train’. All enjoyed in the rain and each bit of atmosphere. Our great singers Sudheendra and Abhishek sung many songs; Sudheendra like Yesudas devotional songs whereas Abhished like Hariharan all rain songs. The Jugulbadi continued till 1 pm and rain took little break. Changed the wet cloth at haunted house. As agreed the TS came at 2 pm to drop us back to Kulem. All dumped luggage and said good bye to beautiful place Tambdi Surla. The time was 3 pm and rats were running in everyone stomach. There was no other option of food except the one hotel from us ordered the dinner. The food was not tasty and quality; everyone finished the lunch and headed to railway station which is just 100 meters. Enough of time ahead us and easiest way to kill it is UNO. All friends again busy in the game and train arrived right time 5 pm. Need to travel in Nizamuddin express till Londa; last visit experience was very horrible if we not boarded in the reserved compartments. This time also I put proposal to Ravee; but he said not ready to take risk. When train reached the platform; saw a goods bogie which very closes to engine and few were travelling in that. I suggested all to get in the goods bogies so that we can have the comfortable journey. 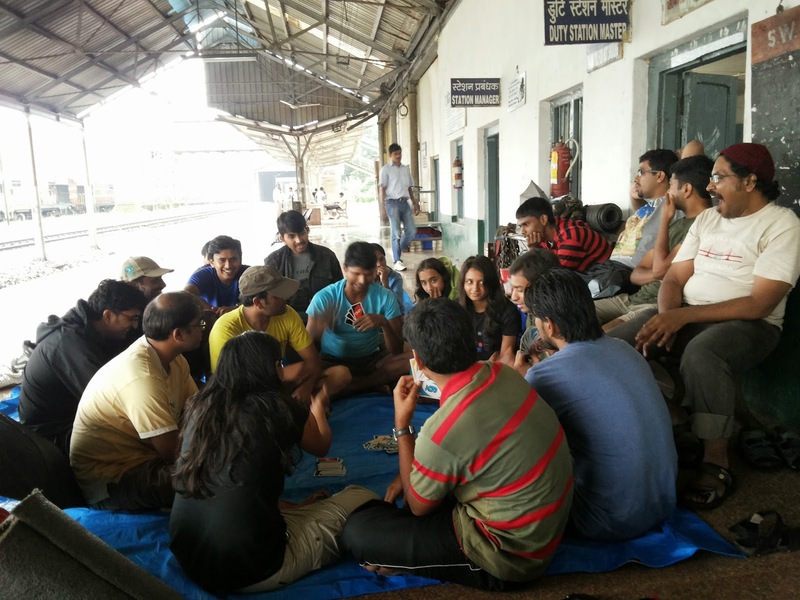 After reaching the Dudhsagar station, we cannot imagine the crowd. All agreed and we boarded in the goods bogie. Few were occupied the top place (small shelf in bogie) and few on the door. 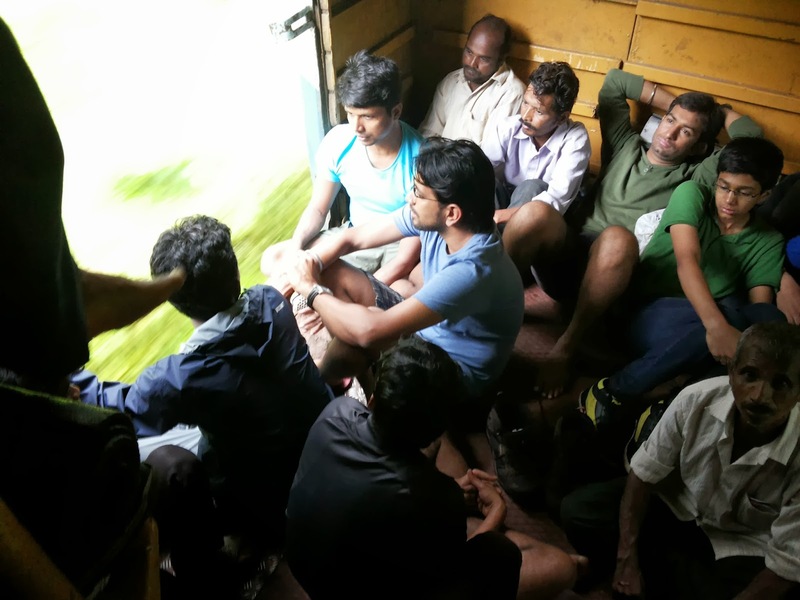 Couple of co-travelers in the bogie suggested to close the doors when it reaches to Dudhasagar else crowd get into this and cant travel comfortably. It happened the same; when reached the station the crowd was more. People were trying to open this bogie and were not known we are inside. Had good time in the bogie; Abhishek, Pooja, Ashok enjoyed and entertained us with their songs. Really Abhishek rocked the whole journey by his songs!!!!!! 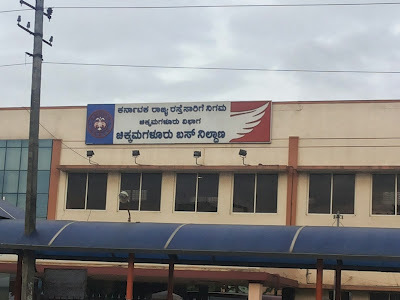 Reached the Londa at 7 pm and had another one hour time to Rani Chennamma Express which we need to catch towards journey to Bangalore. All had their snacks and dinner in the station. Now again the entertain part; Megha leaded the Mafia game. Train arrived right time and everyone boarded; few of us said good night so early; and few enjoyed again dumb share game. As per scheduled the train reached Yeshwantpura at 7 am and said good bye to all buddies hoping to meet in the next trek again. The whole team was rock and Raveendra well organized; thanks to all. Many new friends added into my list, thanks to BASC. Mist evening with rain; sky covering slowly into dark; lost the trail; struggling to find out the way to reach base camp since 3 hours; alas!!! we had hardly 30 minutes to reach the civilization; lost in the Jungle. 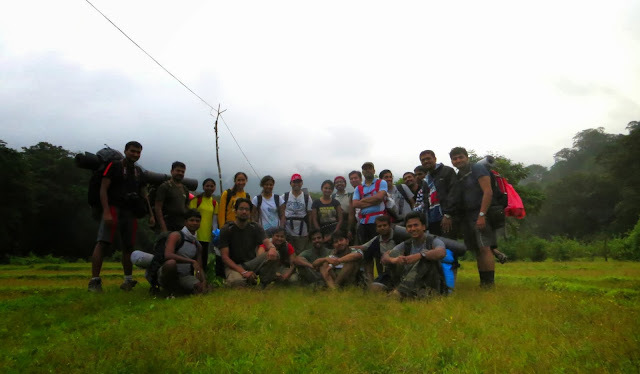 These all are wonderful and so adventurous memories of 2 days BASC (Bangalore Ascenders) trek around Mullayyanagiri – Chandradrona Parvatha on 7 – 8th September 2013. I had been these places two years back with my colleagues; the difference is, traveled by Car. Since it’s one of my to do trek list, did not make delay to register it. Unfortunately it got postponed once, since the heavy rain and land sliding in the month of August 2013. 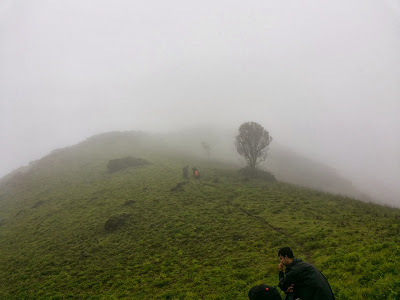 Mullayyanagiri is the highest peak in Karnataka. 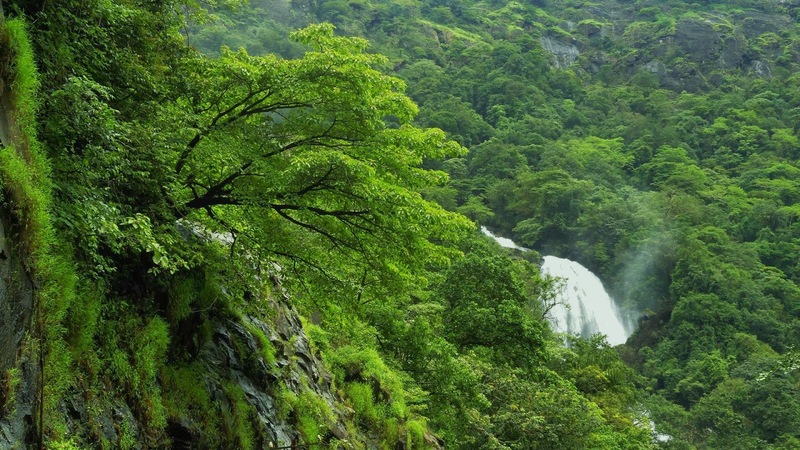 Mullayanagiri is located in Chandradrona Hill ranges of the Western Ghats of Chikkamagaluru. 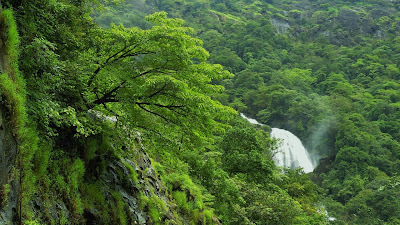 With a height of 1,930 meters (6,330 ft), is the highest peak between the Himalayas and Nilgiris. Mullayanagiri is one of the best trekking places in Karnataka. As usual common assembly point of BASC, Shanthala Silk house, left 12 passionate trekkers around 10.30 pm by Tempo Travel (TT). Most of them were known face and very few were new. 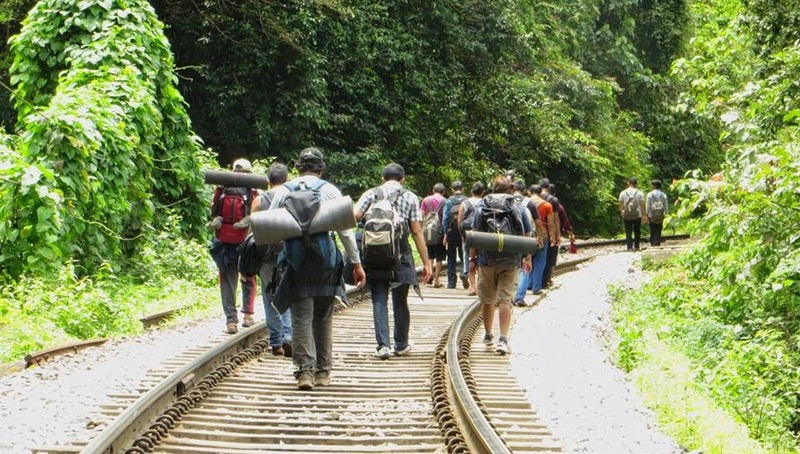 The specialty of this trek is, couple accompanied with us. 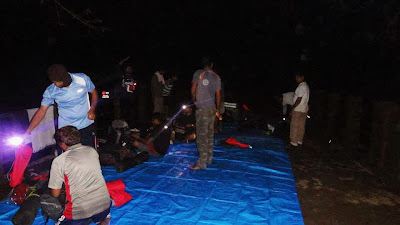 The introduction part and later exchanging the trek experience went on till 12 midnight. This time we hired the tent to camp in the wild. Early morning around 5 am we reached Chikkamagaluru. The city was just awaking and the weather was so cool breeze. Finished the morning nature call at public toilet and had hot coffee. Decided to have the breakfast and get lunch parcel. 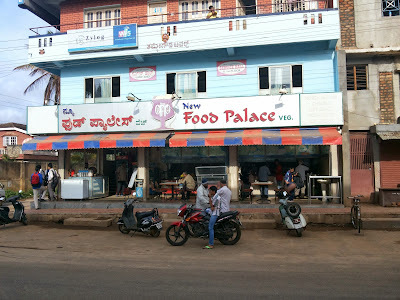 Finished the tasty breakfast at Hotel New Food Palace and took packed lunch Palav. Left towards the starting point of Mullayyanagiri. 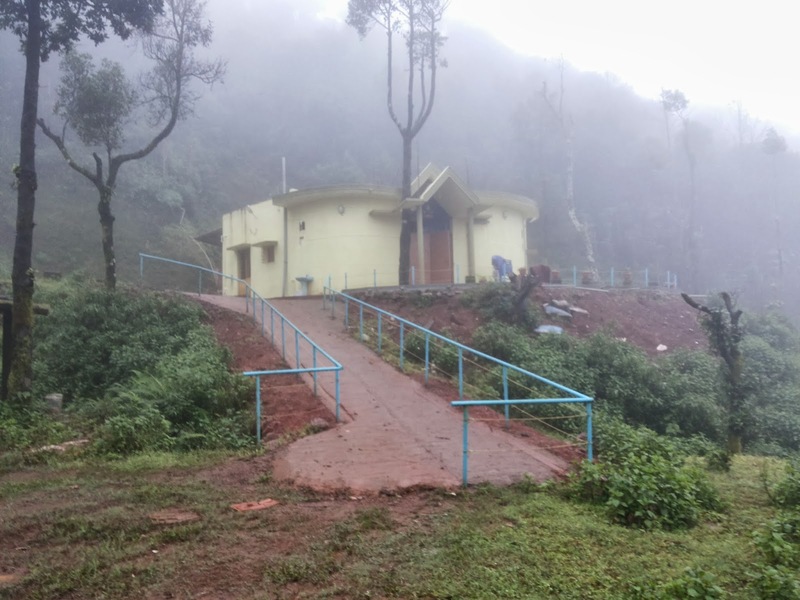 The total distance from Chikkamagaluru town to peak is around 18 km. 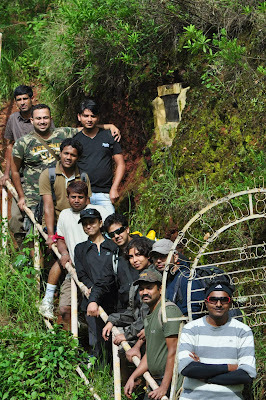 Sarpadari is the starting point of this trek. After crossing the deviation of the Mullayyanagiri road, we need to travel around 1 km further where you find a arch; which is the starting point of trek. Initially we got little confusion and at last reached the correct place. Everyone getting ready to fight with leaches. Our first day night camping was Gaalikere where the TT bring our stuffs. To avoid the luggage, we carried only the water bottles, packed lunch and very essential things. Started our trek at 9 am. Initially we struggle little to find out the correct path, after taking the arch about 100 feet take right up to track the correct trail. The weather was so pleasant and the entire valley was green carpet. It was so beautiful to enjoy the nature in monsoon. 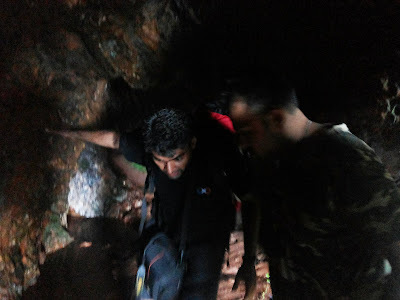 It’s my 4th Monsoon trek in this season and each has it’s own unique. The trail is very clear and nothing found difficult to reach the peak. Taking multiple short breaks and chatting each other reached the first break point at Nandi. A small Nandi temple with covered a beautiful tree. Took group photograph and had exchanged the energy bars. 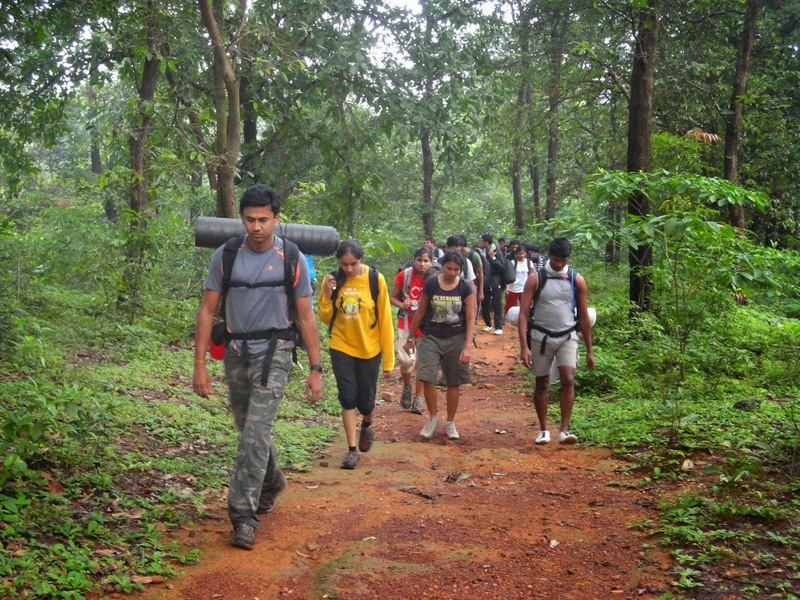 Further need to keep pace left which lead to Mullayyanagiri peak. Reached the peak at 12.30 Noon. The weather is now more romantic. Mist with hide and seek around the hill and drizzling started. 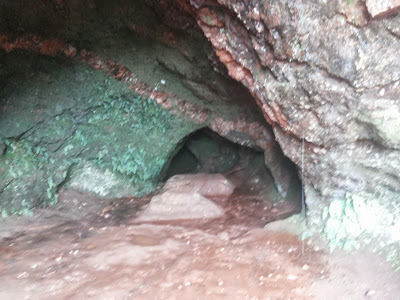 Explored the caves and took many photographs. Decided to have the lunch before proceeding further. 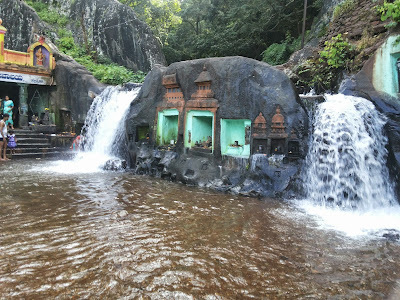 We can find the Mullayya (Shiva) temple at top. 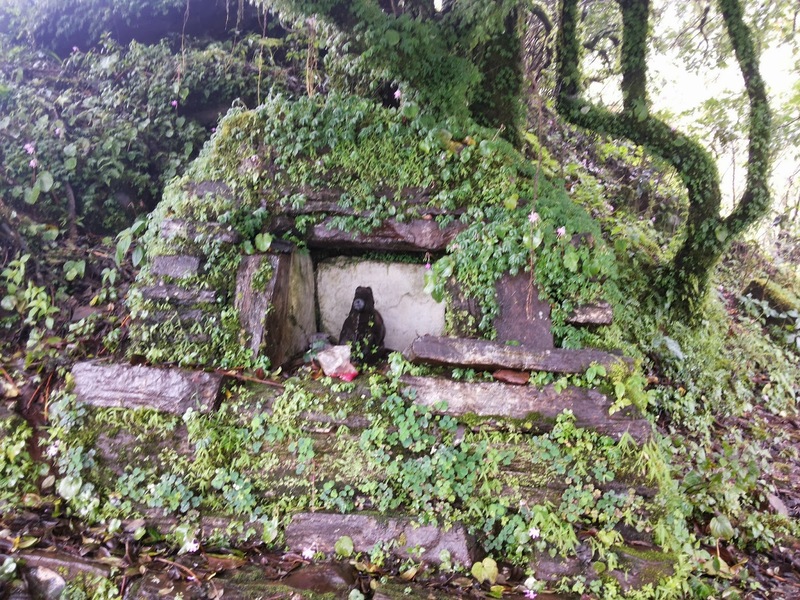 Took darshana and inquired further information about trail to Bababudangiri from priest. There is a Police control room inside the temple premises. They suggested to take the guide to show you the path as its raining and thick mist. The chances of loosing the trail is more and steep valley. Guide ready with 120 bucks to show the path till certain point of distance. The rain took its own pace and mist everywhere. Backside of the temple trail leads to Bababudangiri. Few places its very steep valley and very slippery. We should be very careful while crossing this area. 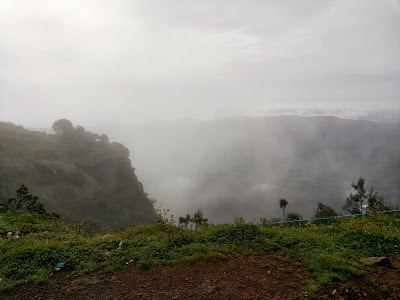 Due to mist and rain we could not able to enjoy the valley. Crossing few pinnacles reached the open area where our guide said good bye us and shown the direction to reach the main road. Enjoying the nature, took multiple breaks with many more photographs. Reached the forest check post at 3 pm. 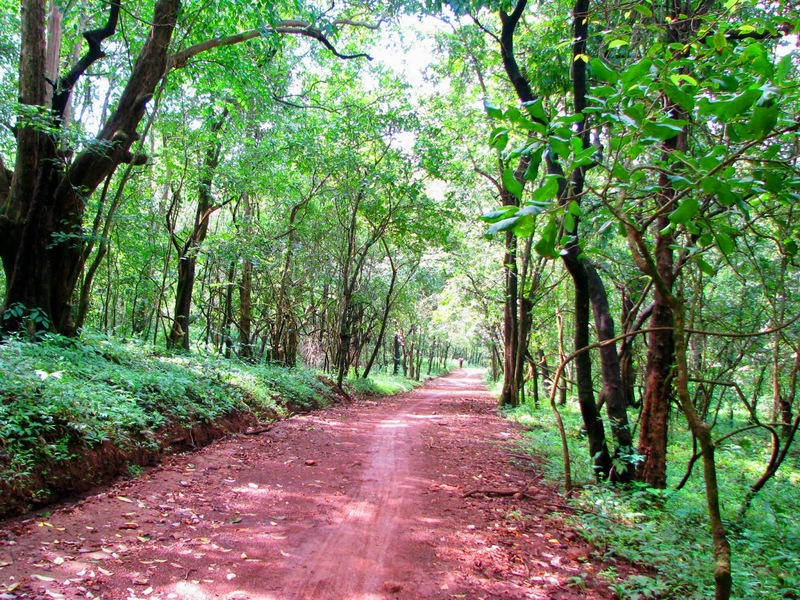 Need to cross the same tar road which is Chikkamagaluru to Bababudangiri. 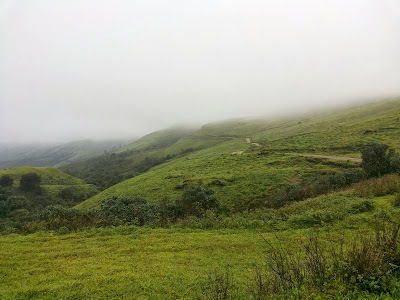 After immediate crossing the tar road enter into other zone of hills. On the way you find the ruined forest check post quarter. The real adventurous journey started now. Till the tar road I was thinking it’s a normal easy trek! Of course it was, where now we were struggling to find out the path. Left side deep valley, a small wrong step can take us to heaven/hell and right side steep hill. 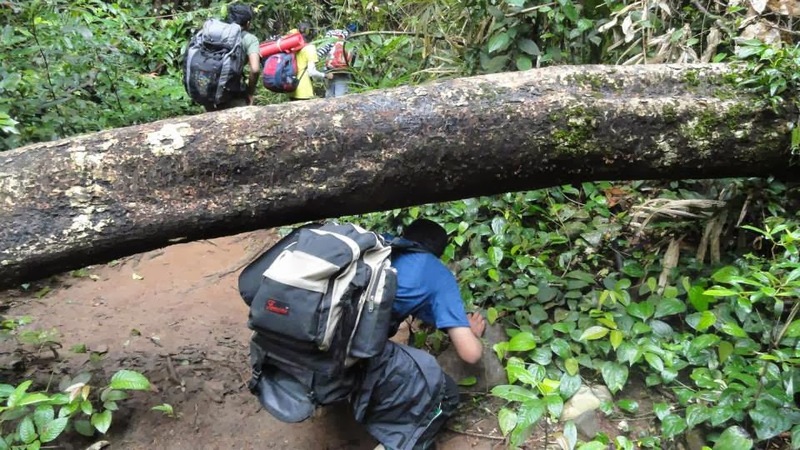 Each 100 meters trail took us wrong path. Not only once, many time we were ending up hill where no way to proceed further and it was ending with deep valley. 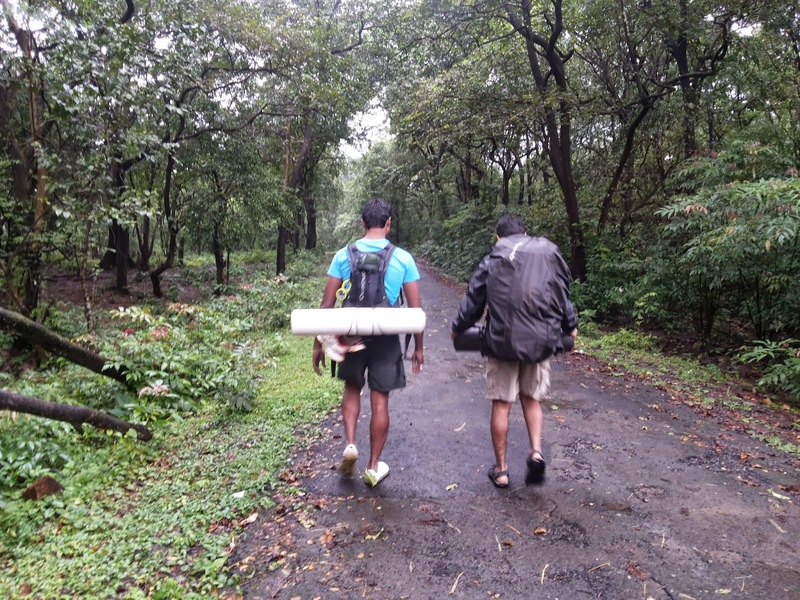 Appreciate Sunil, Sreeharsha and Santosh were the leading the group to find out the trail. 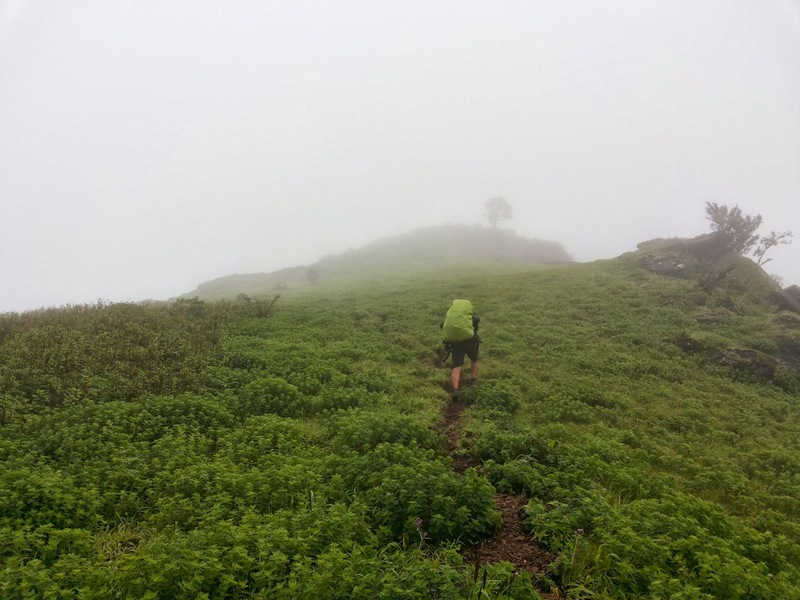 The rain, mist and wind were challenging us during the trek. We could not able to see anything beyond 10 feet. The time was around 4 pm and we were little relax thinking that found the correct trail. It was open grass land with greenery everywhere. 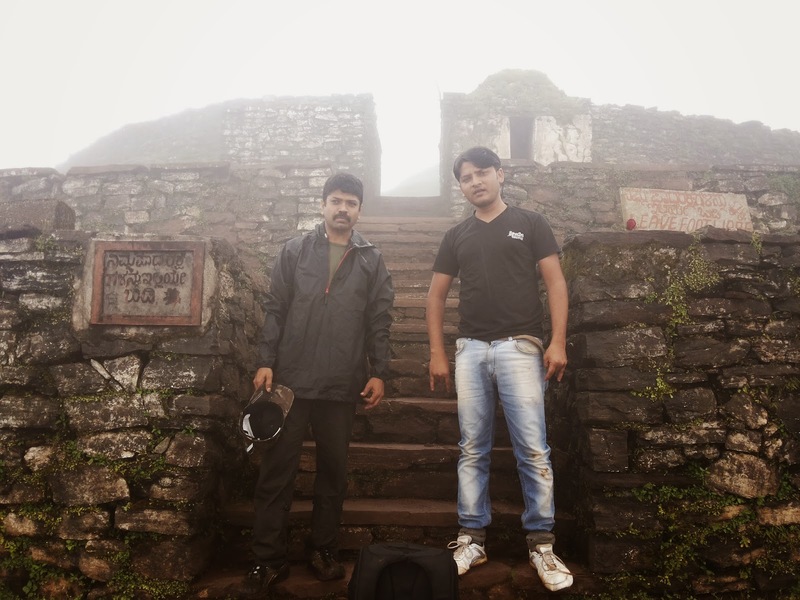 BSNL tower is the only navigator to reach the Bababudangiri, which I was read in many blogs. Unfortunately we could not able trace out the tower due to mist and rain. Now the real twist in our trek, again the trail took us left side of the hill. Almost 2 – 3 km crossed in the open grass land and ended up with deep valley. Now everyone got worried and there was not much time left to explore the path. Few of friends went all around the direction! No one come back with positive. We had hardly 30 minutes to reach the civilization. The sky is become so dark and dark. It was not only tough and very difficult to walk in the night. 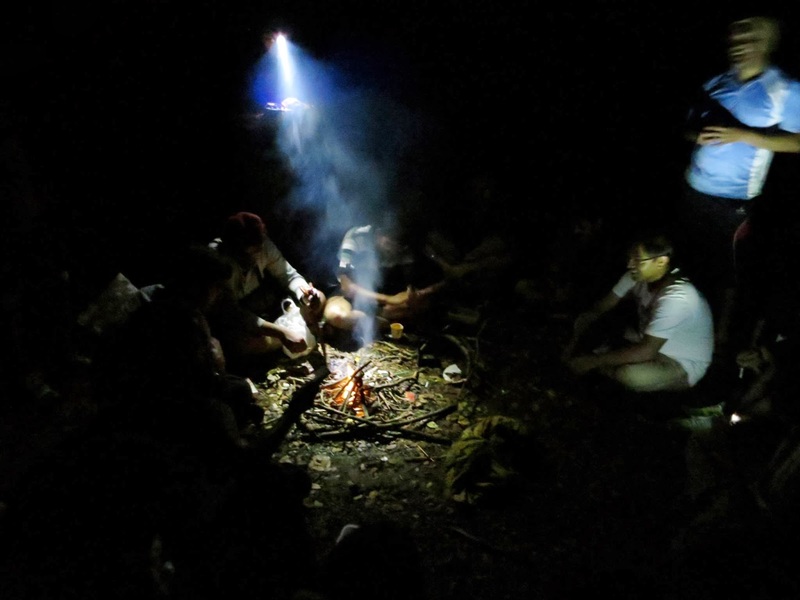 Our all essentials of torches, tents, energy bars left in the TT. 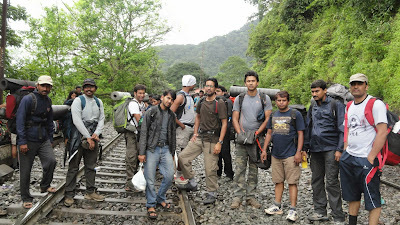 It was very challenging, all of us to go back the initial point which trekked almost 4 hours. We lost in the Jungle!!!! We had quick meeting and decided some what we should reach the tar road. Sunil tried to find out the location through his mobile GPS! However disappointed with no signals. We had the idea of the tar road direction, so decided to go back the same trail until we get some vehicle sound. The pace of the trek was obviously fast. One point of place we could able to hear the vehicle horn sound. Now the typical position is right side thick forest and left side deep valley. 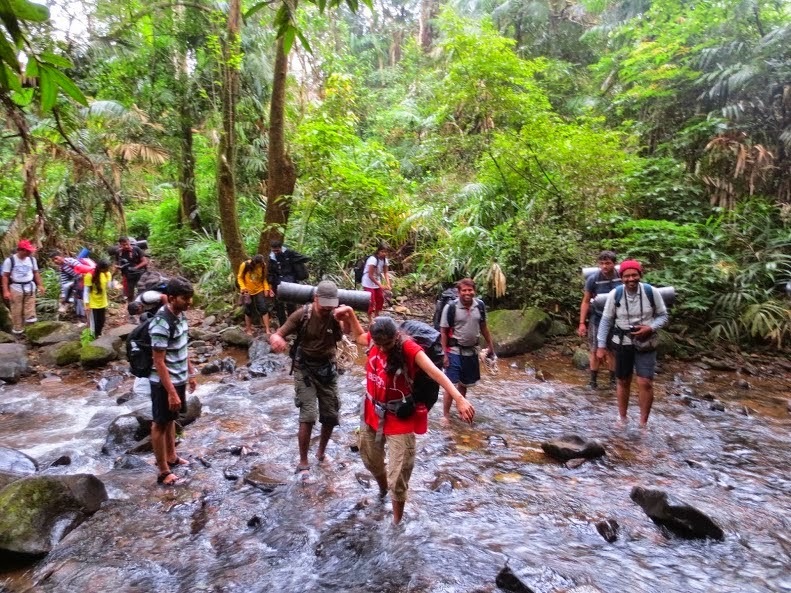 After a km decided to get into thick jungle and follow the stream. Ohhhhh!!! the path was not so easy. Thick forest, bushes, thrones, mud and dark!! Normal time we can’t think to get in, hit it or get out we need to take the risk. The moment of joy was unforgettable. The faces were talking about their victory. In the victory again one more twist! 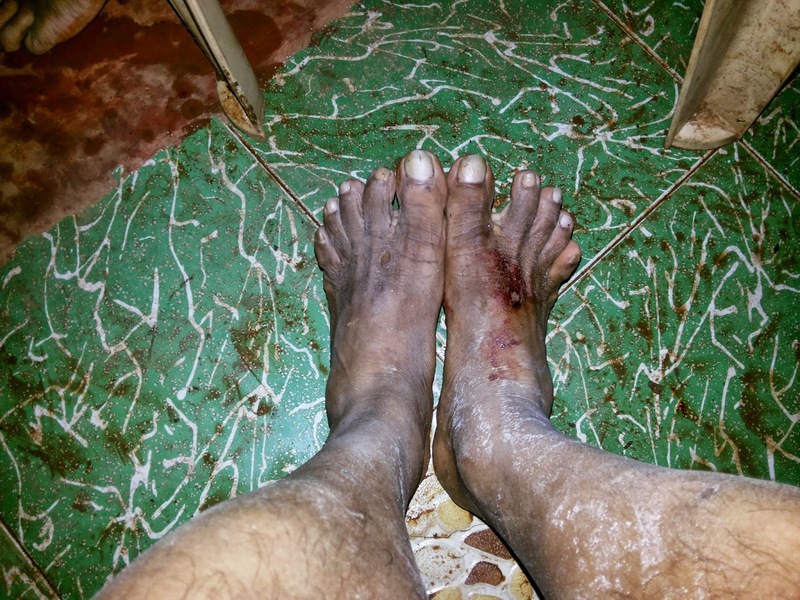 Just I checked my legs…everywhere leeches. Not only me, it’s to all. We had no time to think about them at this point. Everyone mobile network was dead and rain was pouring continuously Luckily we could able to get the lift by jeep till Attigundi. Jeep driver suggested us to stay back at Attigundi and let us call to our TT. Now the time to talk with leeches. Everyone got leeches bite badly. The place quite small village with many hotels and shops. We decided to take dinner and rest the night in home stay. 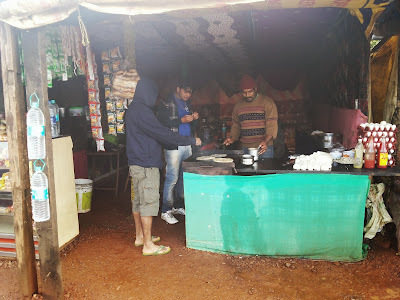 The rain was no break, had yummy Chapati, Omlet, Parotha, Tea and coffee. Moved to home stay and just relaxed. Home stay was really neat and nice location. We had recalled our adventurous part of journey. Really if we could not able to reach the tar road! God knows what will be our situation. After long chitchat everyone said good night at 11.30pm. In almost all trek, I got up very early and it happened here too. Woke up 5.30 am and finished the morning duty. The weather was cold and mist. Home stay surrounding was really beautiful. One by one everyone freshened up and headed towards Bababudangiri. Most of the friends were not ready for long trek today. From our home stay the Bababudangiri is around 20km. First we visited the Manikyadhara which is 4 km away from Bababudangiri. The view of the valley is so beautiful. Spent good time and had breakfast in a small hotel. 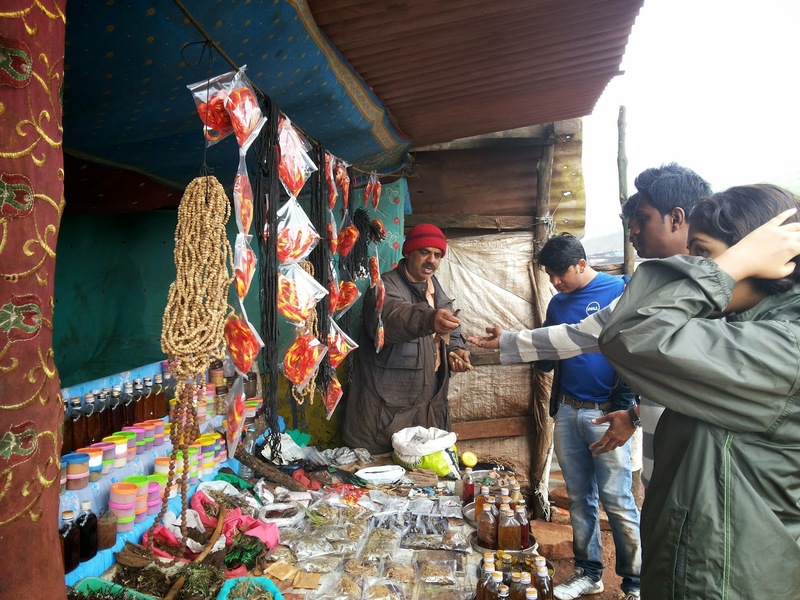 Few of our friends did shopping of Jadi-Booti. Next destination is Gaalikere. From Bababudangiri its around 4 km on tar road. Beautiful green all around and small streams. Spent enough of time at there and took many group photographs. Due to road close we could not able to go Kemmanagundi and Z point. 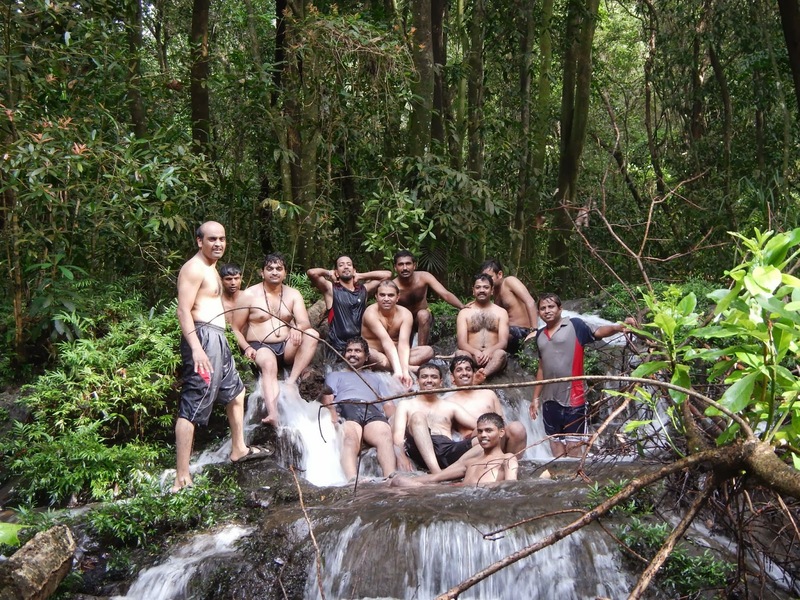 We were helpless and decided to visit at least Kallahattigiri falls. The falls was crowded by people and making nu-sense everywhere. Its pain me whenever I see people making nasty the beautiful nature. Now the time is back to Bangalore. On the way we spent good time at Tarikere lake and back to Bangalore at 3 am. One by one said good bye and promised to meet another trek!!! Many thanks to whole team, so co-operative each one of you! !